Today the Centre of the Chinese Culture and Language has been opened in Vasyl Stefanyk Precarpathian National University. It should be admitted that the 1st of October is the national holiday in China – the day of the formation of the country. The Rector of Vasyl Stefanyk Precarpathian National University, Ihor Tsependa, the Director of Confucius Institute of Kyiv National Linguistic University, Shy Yatszyun, the lecturers and the students, the volunteers – Li Vyentszyun and Sun Hailin took part in the event. 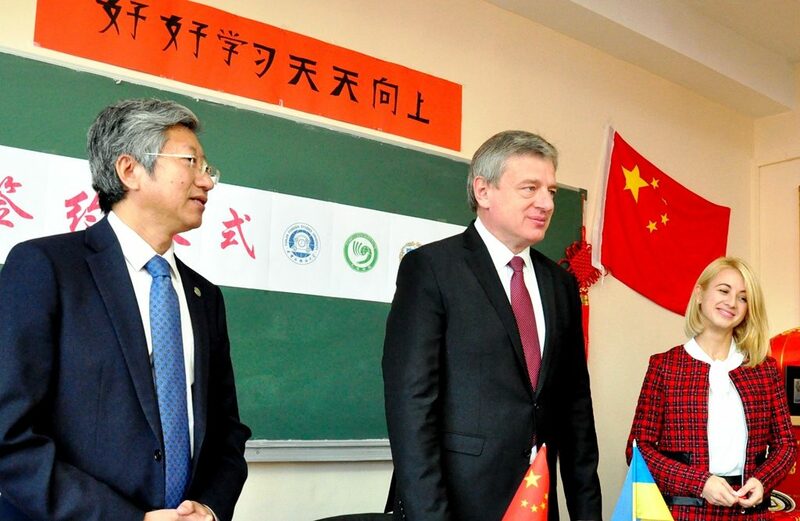 Vasyl Stefanyk Precarpathian National University has been cooperating with many universities of China for 14 years. Recently the Memorandum about the participation in the international university community “Silk Road” has been signed. It should be mentioned that the Centre of the Chinese Culture and Language gives new opportunities for the students of the university. Shy Yatszyun assured that he would support the Centre of the Chinese Culture and Language and introduced the volunteers – Li Vyentszyun and Sun Hailin. They will conduct classes for the students of the Chinese Department of the Faculty of Foreign Languages. The Rector of Vasyl Stefanyk Precarpathian National University, Ihor Tsependa, the Director of Confucius Institute of Kyiv National Linguistic University, Shy Yatszyun signed the agreement about cooperation. According to it the students and the lecturers will take part in joint conferences, seminars, symposiums. At the end of the event the students sang Ukrainian and Chinese songs. Then the tea – drinking ceremony was held. Today more than 70 students study Chinese at Vasyl Stefanyk Precarpathian National University. They take part in different olympiads.